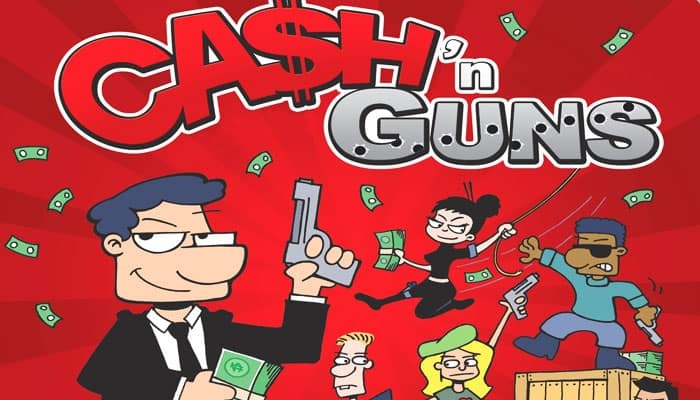 Cash 'n Guns is a party game about dividing the loot from a big heist, but every gangster wants a bigger cut and bullets speak louder than words. 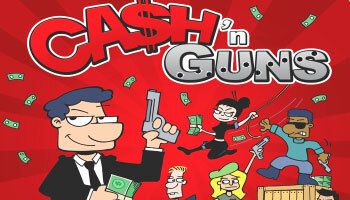 Over the course of eight rounds, players point their gun at someone. But because you have a limited number of bullets in your gun, you must decide to use a bullet or to bluff. You get one chance to chicken out, after that the triggers are pulled and you find out who is right and who is dead. The remaining players (non-chickens) get a chance to split the loot for that round. After 8 rounds, the richest surviving crook wins the game. You can also play the game with different character roles and each role granting a special ability. Each player takes 1 Foam gun, 5 Click cards, 3 Bang! cards, and 1 Character, which they stand in front of them. Shuffle all of the Loot cards and divide them into 8 piles of 8 cards. Put the New Godfather token in the middle of the table, next to the Loot cards. Once you've become familiar with the base game, you can play with powers. At the beginning of the game, deal a Power card face-up to each player. Powers remain active during all the game. Go around the table so that each player can explain their power. This power is considered to be a painting. It is added to your collection at the end of the game.